This article is about the Irish pirate captain. For the West Virginia Attorney General, see Edward T. England. For the Welsh businessman, see Edward England (potato importer). Several vessels, most famously the Royal James and the Fancy. Battle with the Cassandra that caused his crew to mutiny and maroon him for sparing some captives. Edward England, born Edward Seegar (c.1685–1721) was an Irish-born pirate. The ships he sailed on included the Pearl (which he renamed The Royal James) and later the Fancy, for which England exchanged the Pearl in 1720. His flag was the classic Jolly Roger — almost exactly as the one "Black Sam" Bellamy used — with a skull above two crossed bones on a black background. Like Bellamy, England was known for his kindness and compassion as a leader, unlike many other pirates of the time. England was born in Ireland around 1685. He took part in Henry Jennings' expedition for the sunken 1715 Treasure Fleet off the coast of Florida, and then began sailing with Charles Vane in 1718. Upon Vane and other prominent pirates accepting the King's Pardon, England and some of his men sailed for Africa. Along his way he spawned the career of Bartholomew Roberts, among others. In 1720, near the African island of Comoros, England and his men got into a violent conflict with James Macrae. After 10 days of hiding on an island, England and Macrae agreed to a peace deal, upsetting England's crew; he was subsequently voted out as captain and marooned on the island of Mauritius. After four months, England and the loyal crewman that had been stranded with him managed to build a boat and sail to a pirate safe haven in Madagascar. He died sometime in the winter of 1720-21, possibly from tropical disease. Born in Ireland as Edward Seegar sometime around 1685 He was probably raised a Catholic, and was said to be an educated man. Seegar changed his surname to England when he turned pirate. 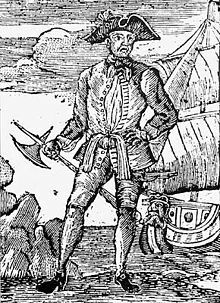 Some sources claim "Seegar" was not England's name at all, but was instead a separate pirate (Jasper Seagar) who sailed under England. England made his way to Jamaica and during the War of the Spanish Succession he served as a privateer. He was captured by the pirate captain Christopher Winter and forced to join the crew. Winter took England to the pirate base on Nassau, Bahamas. England took part in Henry Jennings' assault on the Spanish salvage camp at Palma de Ayz, Florida, stealing £87,000 in gold and silver. England is next reported as Charles Vane's quartermaster, in March 1718. Vane's sloop, the Lark was captured by the Royal Navy, but England and the rest of the crew were released to induce the other pirates of Nassau to accept the King's pardon. England was granted captaincy of his own ship in mid-1718. England decided not to accept the pardon along with Vane and a few others, and after the arrival of Woodes Rogers they set sail for the coast of Africa. Ah! Captain Skinner is it you, I am much in your debt, and now I shall pay you in your own coin. A group of pirates next grabbed the captain, tied him to the windlass and threw empty bottles at him. Next because he had been a good master to his men they gave him a quick death by simply executed the captain by shooting him in the head with a flintlock pistol. Given the crew of the Cadogan was without a captain, England offered them a choice to join his crew. Aboard the crew was Howell Davis who refused to sign the articles of the pirates. Howell said he would rather die than become a pirate, however England refused to kill him and instead gave command of the captured ship to Davis. This began the start of Davis' pirate career. Davis would go on to spawn the career of Bartholomew Roberts as well and the careers of many other pirates. After some time, England and his crew captured a larger brig or frigate named the Pearl. Taking the ship as their own, they renamed it the Royal James and in the spring of 1719 went off in search of plunder in Africa. Between the Gambia River and the Cape Coast, the pirates seized and looted ten ships. Two of these they kept as prizes, granting them to Captains Robert Lane and Richard Sample, who left England to sail for the Caribbean. After looting the ten ships, England made John Taylor the captain of his next prize, the Victory. After looting two additional ships, England and the crew decided to make port in a small African town. However the pirates grew increasingly belligerent and conflicts arose with the locals over the treatment of women. Soon a fight broke out, resulting in the pirates burning the entire town and departing. While plundering a town in Southern Africa, England saw a beautiful woman by the name of Amy Brionso. He kidnapped her and kept her in his captain's quarters. England comforted her and she slowly began falling in love with him. Years later, the couple married and had a child they named John Edward England. Captain England, concerned for the safety of Amy and their child, left them on the eastern coast of Southern Africa. Before departing, England asked his wife to instruct their son to name his first-born son John, after himself, and expressed his wish that doing so would become family tradition. By 1720, England had reached the Indian Ocean, where he met with fellow pirate Captain Oliver la Buse. England captured a thirty-four gun Dutch ship, which he named Fancy in honour of English pirate Henry Every, and he made the Fancy his new flagship. England decided to attack an East Indiaman under the command of James Macrae, the Cassandra, near the island of Comoros. A long and bloody battle ensued, and both ships ran aground. Macrae and his surviving crew escaped and hid on the island for ten days. Finally Macrae, who was injured, tired, and hungry, went aboard England's consort the Victory, hoping for mercy, and surrendered to the pirates. The cargo of the Cassandra was valued at £75,000. Ninety of the Fancy's crew died in the attack on the Cassandra. England had a good nature and unusual kindness, in that he did not believe in torturing captives unless they could not otherwise be persuaded. England ordered Macrae's life spared, and the pirates kept the Cassandra and gave the heavily damaged Fancy to Macrae. England's quartermaster, John Taylor, who was now captain of the Victory, resented this choice, and only agreed after England got him drunk. England then captured a small English ship near Cochin, the drunk captain reporting a false rumour that Macrae was preparing a fleet to chase the pirates. This enraged the pirates, particularly Taylor, who had wanted to kill Macrae. Around this time, Taylor organised a vote to remove England from command. England was subsequently marooned on Mauritius (known from 1715-1810 as Ile de France) with three other loyal crew members. They were put ashore without adequate provisions, and were forced to scavenge. One of the men marooned with England who had also defended Macrae was described as "a man with a terrible pair of whiskers and a wooden leg, being stuck round with pistols," and is said to have been the model for Robert Louis Stevenson's character Long John Silver, though this is uncertain. After about four months, the men built a small boat and managed to sail to the pirate haven of St. Augustine's Bay in Madagascar. After arriving at St. Augustine's Bay, England survived for a while on the charity of other pirates, possibly some of Henry Every's old crew. He died in late 1720 or early 1721, possibly from tropical disease. England's son John eventually did as his father had wished and named his son John as well. This tradition continued among England's descendants. He had a great deal of good Nature, and did not want for Courage ; he was not avaritious, and always averse to the ill Usage of Prisoners received : He would have been contented with moderate Plunder, and less mischievous Pranks, could his Companions have been brought to the same Temper, but he was generally over-rul'd, and as he was engaged in that abominable Society, he was obliged to be a Partner in all their vile Actions. ^ David Marley (2010), Pirates of the Americas: Volume 1, p. 583. ^ Angus Konstam and David Cordingly (2002), The History of Pirates, p. 132. ^ Fox, E. T. (2014). Pirates in Their Own Words. Raleigh NC: Lulu.com. ISBN 9781291943993. Retrieved 17 June 2017. ^ Grey, Charles (1933). PIRATES OF THE EASTERN SEAS (1618-1723). London: PURNELL AND SONS. Retrieved 1 June 2017. ^ a b c d e f g Johnson, Captain Charles (1724). A GENERAL HISTORY OF THE PYRATES. London: T. Warner. p. 124. Retrieved 18 June 2017. ^ Colin Woodard (2008), The Republic of Pirates, ISBN 0-15-603462-X, p. 234-35. ^ According to Johnson's "General History," the Elizabeth and Katherine was renamed Flying King under Sample; she was run ashore by a man-o'-war off Brazil in November 1720 and her crew captured by the Portuguese. The Mercury was renamed Queen Ann's Revenge (not to be confused with Blackbeard's ship) and given to Lane; after taking several ships it escaped from the man-o'-war that caught Sample but was lost offshore with all hands. ^ The same sources which claim Jasper Seagar was a separate pirate from England also place Seagar in command of either the Fancy or the Victory during the battle against Macrae'sCassandra.